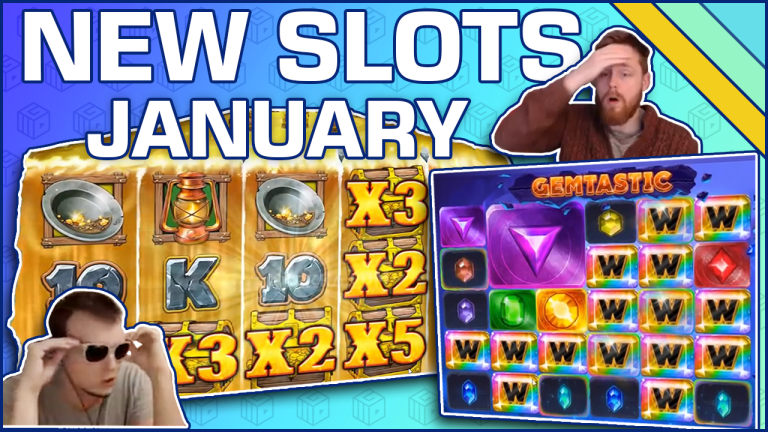 January showed some light on the dark times with the new slot releases. 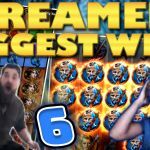 January was filled with huge slot wins which we proved while watching slot streams. 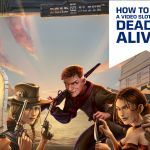 Game providers have stepped up in the game as we have nine clips in total on this video treat for you, and some of the big wins come from the up and coming game providers. It’s good to see that new providers are stepping up in the game! Foxium is starting to get their name out. Spintwix is rolling with a nice €5 bet on The Great Albini, when the random feature ‘Mystery box Respin’ triggers during the spin. The feature reminds about the ‘Donuts’ re-spin feature where you try to get the multiplier. It’s the same, but the mystery boxes turn into random symbol. Luckily, the best symbol shows up for the feature, and the screen is 2 off from the full screen. In the clip, it looks like Spintwix do not have any idea how big the win is, and he gets surprised when the total win shows on the screen. Red Tiger have been active lately with their game releases and Gemtastic was not a disappointment. Labowsky is playing this potential slot, when he gets 8 wilds on the screen, and the grind begins. After every win, the multiplier increases by one. After the next drop down, there is 15 wilds and multiple wild lines connecting. Multiplier gets up to 5x but all the wilds disappear and the spin ends. David do not have a clue, how much the win is, but he knows its big. Chance Interactive had a big and successful game launch with LetsGiveItASpin and during this, Kim gets a surprise win during the free spin feature. He gets the hammer feature while having the the best symbol on every reel. The normal spin pays for him 4,3k SEK and he gets 2x3 extra wilds with the feature. This means that he gets the original win + 6x4,3k SEK which makes it nearly a 300X win on one spin. Miikapekka has grinded the latest BTG title Holy Diver all the way to the 3x multiplier bonus feature. On this slot, you need one good spin on the bonus feature to make the grind worth. Miikapekka gets this one good spin on the fifth spin. He lands 3x wild on every possible reel, premiums on the first reel, and symbol 10 going all the way to the end. This one spin pays him 550X win. Cazino Zeppelin 2 has been a happy release. New grind slot with huge potential in the normal feature, without special mode can pay, but this time ‘’Zero Gravity’’ feature shows the magic. This is a really good proof of it. After Five spins, bonus had paid a bit over 150x but then it starts to pay. At least two lines with five of kinds every spin are key for the 1000x win. On the last spin, the missing wild for the extra spins land on reel 4. Before the extra spins, bonus has paid 300x, so on the third last spin wild line finally lands which increases the win so huge. A 1000x win is always a 1000x win, great hit. Slotspinner was not familiar with the latest ELK slot that time, so he gets surprisingly good win on ‘’The Wiz’’ slot. On the third spin, first 3x wild lands and since it moves to left after every spin so with one wild maximum of 5 extra spins. This time, this 3x wild lands on reel 3 so three extra spins are awarded and on the second last extra spin, some five of a kinds land. This one spin pays already alone over 100x. On the last spin, he gets 2 wilds, for 5 extra spins and since these wilds are connected to each other on paylines, a big win is guaranteed. These spins pay him some good money, but we think that this slot has more potential than we saw in this clip. This Play ‘n Go version of Raging Rhino has surprised a lot of slot players after the release. 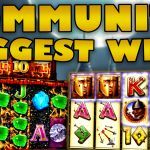 Huge potential for a big win is everything a casino player needs, and Spintwix gets a great one with the ‘’Wild Hunt’’ Feature. Two meteor symbols re-triggers in this slot, and we see a lot of them in this clip, almost endless free spins. On the 29th spin, Spintwix gets first over 100x win with 2x wild, normal wild and 3x wild. These wilds and the second best dinosaur going all the way to end pays him 210x win. Next spin, he gets 4 wilds and three of them have 2x multiplier, but it's not connecting with premiums, paying almost 50x. On the last spins, he gets one more 45x win, but other spins are not paying. Great potential on this slot. 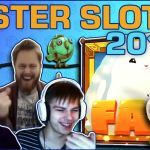 The new and first Feature buy slot from Kalamba Games/Relax Gaming has gained some YouTube time after the release. 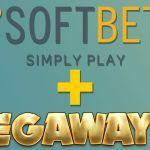 So it does this time, as Bandit buys the feature for £333 and gets 15 free spins. Microchip grind shows an important role in this slot. After nine spins, two of the premiums have been changed to best jackpot symbol, but the winnings are still 20x. When the third symbol changes, the winnings start to come. On the first spin with three symbols as the best one rewards with a silver jackpot, and few spins later, he gets to the max level. On the max level, jackpots are coming almost on every spin, and the win increases for over 500x. Ladies and Gentlemen, the most potential slot of January: Wild Falls. In this clip, the see the second biggest win when the Gold Rush feature lands. Miikapekka gets excited when he sees 3x, 2x and 5x wilds connecting with the best symbol of the game for a full line. This full line with the best symbol pays over 700x and since the wilds fall by one every spin, these wilds are connecting 2 more times. Next spin pays over 200x, and the spin after, he connects a full line with the second best and K symbol. This spin alone pays almost 800x. Last spins make sure that the 2000X line passes for the biggest win of January on the new slots.